Have been extremely busy with work and travel and apologise for not commenting on pictures. Going to Ranthambhore tomorrow (5th Feb). This trip is for Tiger Watch, an NGO I am associated with as a Treasurer. Will surely catch up next week. Shot hand held at ISO 2500 f5 1/25 sec. One more pic from the wedding venue. 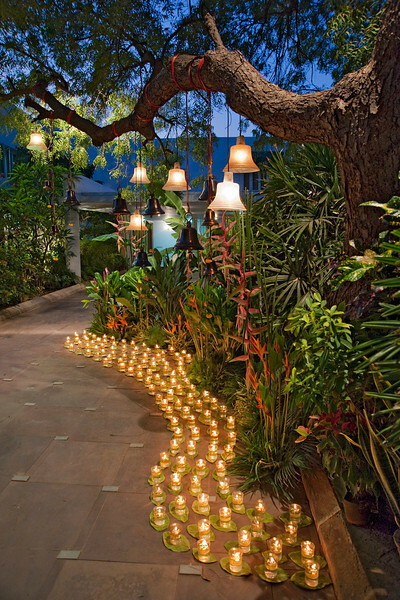 The glasses with oil lights were set up on floor near the entrance to the garden and bell shaped lights were hung from the tree. Beautifully lit entrance...nicely composed shot. Gorgeous display of lights and foliage in this scene. What a nifty little place! I like the use of line here. Very nice, what a lovely entrance to a wedding. Great shot! Looks quite beautiful.